Navigate: Home / Rafting / Cargo Drop Bags & Floors / Drop Bag - Large 18" x 40"
Drop Bag - Large 18" x 40"
Drop Bags are made to hang from your frame and allow the maximum utilization of space while keeping your gear low and out of the way. Our Drop Bags are constructed of heavy cordura with mesh bottoms and have 1in cam straps sewn into the bag for suspending from your frame. 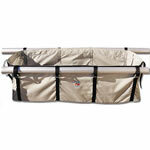 When using a drop bag it is necessary to have a Folding River table or a plywood deck for a lid to keep gear secure. To keep the bottom of your drop bag rigid, we suggest a drop bag pad of 1in Ethafoam cut to fit. The Ethafoam is firm enough to keep the bottom stiff but soft enough that you won't swear a blue streak when you kick it with bare toes. From Ben Grave of Platteville, Colorado on 9/29/2018 . From Boonedog of Oakley, California on 12/14/2015 . From Anonymous of Eureka, California on 6/11/2015 .